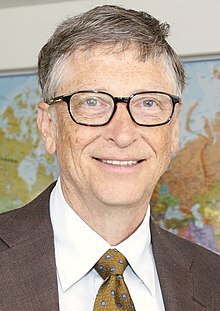 ↑ "Bill Gates (American computer programmer, businessman, and philanthropist)". Retrieved March 20, 2013. ↑ Sheridan, Patrick (May 2, 2014). "Bill Gates no longer Microsoft's biggest shareholder". CNN Money. Retrieved August 22, 2014. ↑ Wahba, Phil (September 17, 2008). "Bill Gates tops US wealth list 15 years continuously". Reuters. Archived from the original on September 16, 2012. Retrieved November 6, 2008. ↑ "The World's Billionaires". Forbes. Retrieved November 30, 2014. ↑ "Bill Gates's Net Worth Hits $90 Billion: Chart". Bloomberg. 2016. Retrieved August 23, 2016. ↑ Einstein, David (January 13, 2000). "Gates steps down as Microsoft CEO". Forbes. Retrieved January 21, 2016. ↑ "Ancestry of Bill Gates". Wargs. Archived from the original on September 16, 2012. Retrieved June 9, 2010. ↑ "Scottish Americans". Alba West. Archived from the original on July 18, 2012. Retrieved April 29, 2009. ↑ Gates 1996, p. 12. ↑ "National Merit Scholarship Corporation – Scholars You May Know". nationalmerit.org. Retrieved October 25, 2015. ↑ Michael Hitt; R. Duane Ireland; Robert Hoskisson. Strategic Management: Concepts and Cases: Competitiveness and Globalization. p. 263. ISBN 978-1-111-82587-4. Retrieved October 25, 2015. ↑ ୨୯.୦ ୨୯.୧ ୨୯.୨ Kestenbaum, David (July 4, 2008). "Before Microsoft, Gates Solved A Pancake Problem". National Public Radio. Archived from the original on September 16, 2012. ↑ "UT Dallas Team Bests Young Bill Gates With Improved Answer to So-Called Pancake Problem in Mathematics". University of Texas at Dallas. September 17, 2008. Archived from the original on August 5, 2012. ↑ ୩୨.୦ ୩୨.୧ Gates 1996, p. 19. ↑ "Microsoft Visitor Center Student Information: Key Events in Microsoft History" (.DOC). Microsoft. Archived from the original on February 26, 2008. Retrieved February 18, 2008. ↑ ୩୬.୦ ୩୬.୧ ୩୬.୨ "Microsoft history". 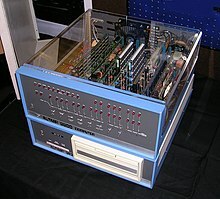 The History of Computing Project. Archived from the original on May 23, 2012. Retrieved March 31, 2008.